Dave is known for being positive, encouraging, engaging, challenging and upbeat about the future including AI, big data, digitalization and much more, looking towards The Future of the World of Work. He looks at “humans plus machines” to combine the best of both. Not “humans versus machines”. His view is not nihilistic: it’s not Armageddon or “the Terminator”. Dave’s work as a published thought leader allows him to begin new conversations with audiences to resonate at all levels about the changing nature of work, which requires greater flexibility, collaboration, creativity and innovation. His clients include Google, Facebook, Vodafone, Dropbox, Connect Plus M25, UBM, New Civil Engineer, CIPD, Communisis, The Law Society, London Business Forum, Richmond Housing Partnership, MCA Insight, Pancreatic Cancer UK, Baillie Gifford, Richmond Events, Gladstone Software, PHD Dubai, The Economist, Mizuho International Bank, Business Centre Association, Mind The Product, Association of Relocation Professionals, Public Service Manager’s Association, Lucy Cavendish College (University of Cambridge) and Nickelodeon. In December 2017, Dave was invited to open, and to close, the Children’s Global Media Summit over three days in Manchester UK. HRH Prince William was the keynote speaker on Day Two of this important, global event. Technology geekdom is in Dave’s DNA. A life-long Star Trek fan, he is a former Crystal Maze winner: these attributes all combine to create this friendly, approachable, optimistic, beardy, pony-tailed alchemist. With over 25 years in the technology industry (and via his former “day job” as “Chief Envisioning Officer” at Microsoft) Dave is at the forefront of conversations on how individuals and organisations could benefit from the transformational potential that technology offers, rather than simply using it to do the same things, but only slightly better. At Destination Star Trek, he took to the stage on a subject close to his heart – how technology, and even innovations referenced in Star Trek, are being brought to life now, changing the way we live and work forever. One of the most influential people in the digital industry, he was nominated as one of the Drum’s Digerati(2013, 2014) BIMA’s Hot 100(2013) and the Digital Marketing Show’s “Class of 2014”. Bringing new and exciting thinking to the world of work, Dave’s books Business Reimagined and The Rise of the Humans discuss the need to rethink how we use technology to make it work for us, not against us. The books sold over 12,500 copies last year and Dave is working on his next book. The Rise of the Humans (2014) shines a light on the deluge of digital information which surrounds us in work and in life, threatening to overwhelm us. Dave argues that the sheer volume of information often prevents us from ever going deep into subjects and it constrains us from getting the much-needed headspace to think. He claims this deluge often leads us to “snack” on data in a way that’s unhealthy for our minds, working styles and, most importantly, our lives. With a loyal audience on social media, Dave is a prominent and regular voice at leading industry events and platforms including the RSA, WorkTech, and Cloud World Forum. He was a guest on Sunday Brunch (C4) 31 Dec 2017. His RSA Animatevideo on the need to re-imagine work has generated over 800,000 YouTube hits to date. His point of view resonates widely. Addressing the intersection of modern society technology through his public speaking and published work, Dave is spearheading the development of the UK’s IT and digital industries by helping people to understand and aspire to greater outcomes from our use of technology. Dave reminds me of someone. The insight he brings and the authentic way he communicates makes you think he's somehow got hold of the future and brought it back, almost making you think he is looking back at us from the future. In 50 years’ time, we'll all say "Wow, weren't we funny back then!" He's like the modern Marty McFly - and my favourite line "I guess you guys aren't ready for this yet.... but your kids will love it." Describing himself as a “naïve optimist”, he sees a world in which technology exists to enable us humans to do things differently and better. While the report makes for some gloomy reading, Coplin himself already sees signs that businesses are thinking about what they are asking of their people in terms of constant connection and responding to the constant stream of data. The key, he believes, is for leaders to move away from “coping mechanisms” that are flawed and to instead confront the issue head-on. “We talk about having too much information like it’s a problem,” he says, adding that businesses should be thinking of how they can use that information better. 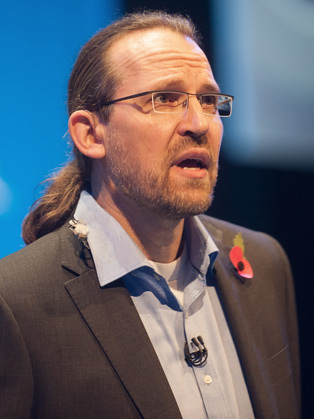 Dave Coplin delivered an inspiring and engaging keynote at our PPMA National Conference attended by over 300 Chief Executives, senior directors, managers and guests from across the UK and North America. From the start of the keynote until the end, Dave created an interactive environment that kept the delegates engaged throughout, with his informative and enthusiastic delivery. Feedback from delegates has been amazing and I’ve had many comments from many delegates about how much they enjoyed Dave’s session…. it was funny, enlightening, thought-provoking, entertaining and educational. I look forward to working with Dave more in the future, and to seeing him present at another Conference soon.